Welcoming to weddingplanner.co.uk our new regular writer Camilla J Collins, the lovely Hair and Makeup artist who is here to give us all her expert advice on looking absolutely stunning for your wedding day. With a long career in the film industry, she found her calling in the wedding industry working with brides to make them feel truly special on their wedding day. With previous clients including Louis Vuitton, Wahl, Claridge’s, Fortnum and Mason and Warner Brother’s studio to name but a few - she truly knows her stuff! So stay tuned as she shares all her knowledge on the ultimate in bridal beauty. Camilla – it’s a pleasure to have you! “Hello to all you lovely new Brides-to-Be - don’t you just love the new year? The Christmas and New Year period is about the only time in the year that I’m forced to slow down and give my mind space to relax, think and reflect on what has just gone on in the last 12 months - and what a truly fabulous year 2016 turned out to be! Amongst lots of other fun and creative things, I had the pleasure of once again last year styling lots of beautiful brides and their bridal parties! And honestly, nothing fills me with more joy than looking back on all their beautiful wedding photos and reminiscing. So based on last year’s hair trends is there any way we can predict what’s in store for bridal trends of 2017? Low buns and chignons were featured A LOT in 2016. Hair vines featured a lot through the year and as well as being incorporated to half up and half down styles, they were also used to sit on top of chignons or wrap around buns. Some brides even decided to wear the hair vine a little differently and we scrunched up and manipulated it to create a side accessory also. Hair vines are definitely the most versatile of hair accessories out there at the moment and can make a gorgeous addition to many a wedding hairstyle! At many a hair trial last year, Braids and Plaits were trialled every which way - some made the cut some didn’t! 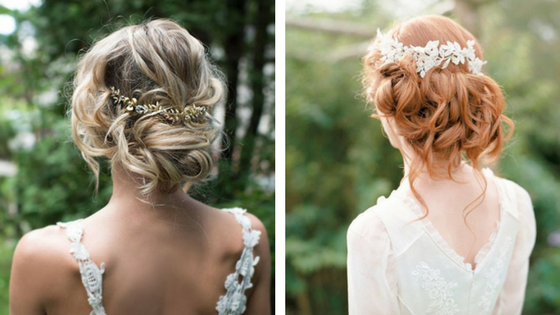 The looser the plait or braid the better and I created some gorgeous, soft boho chic styles. In some cases a simple braid at the side or a small plait or braid incorporated into a half up, half down style was favoured for both bride and bridesmaid hairstyles. We love a bit of volume! Who wants limp locks on their wedding day? Volumous hairstyles were a popular choice with a heightened quiff featuring in a lot of 2016 bridal hair styles. Heated rollers were always at the ready to create height, body and bounce for updos as well as half up and half down hairstyles. Beach waves have been a growing trend for a while and even looser, more relaxed curls in the form of beach waves were definitely more prevalent in 2016! Getting the perfect, relaxed, “no effort” wave can be a tricky one. These looser waves don’t wear and hold quite as well but with a hot curling wand and the right products we managed to create some lovely softer styles that held out the day… and long into the night! If you would like Camilla and her glam team to help you out with your hair and make up on your big day, head over here to find out more and enquire.